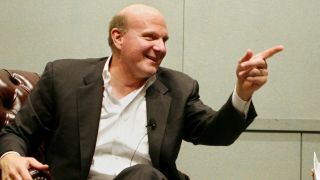 Steve Ballmer may just leave Microsoft on a high note. The company reported first quarter 2014 earnings today in what could be Ballmer's last few months in the CEO suite. It was a "record" quarter revenue-wise, something that should put a smile on Steve-O and investors' faces alike, especially as consumer PC sales stay shaky. The company pulled in $18.53 billion (about £11.4b, AU$19.2b) in revenue during the three months ending September 30. About $113 million (about £69.8m, AU$117m) of that is a deferral of revenue from Windows 8.1 pre-sales. Net income hit $5.2 billion (about £3.2b, AU$5.4b), up from $4.97 billion (about £3.07b, AU$5.17b). "Our devices and services transformation is progressing and we are launching a wide range of compelling products and experiences this fall for both business and consumers. "Our new commercial services will help us continue to outgrow the enterprise market, and we are seeing lots of consumer excitement for Xbox One, Surface 2 and Surface Pro 2, and the full spectrum of Windows 8.1 and Windows Phone devices." It's total Devices and Consumer sector revenue grew 4% from October 2012 to $7.46 billion (about £4.6b, AU$7.76b). CFO Amy Hood noted in the release that "enterprise renewals were very healthy and our devices and consumer business continued to improve." Unlike last quarter, Microsoft had good news to report on the Surface front. Whereas in Q4 2013 the company had to swallow a $900 million (about £591m, AU$981m) write-off related to Surface RT, the story this time was that Surface revenue grew to $400 million (about £247m, AU$416m). The company saw growth in both revenue and units sold over the previous quarter, though it didn't specify how each tablet variant fared. Despite an uptick in Surface stats, Windows OEM revenue was down by 7% from the same quarter last year. Windows Pro revenue grew for the second straight quarter, but Microsoft didn't disclose by how much. Commercial revenue, on the other hand, jumped 10%, raking in $11.20 billion (about £6.9b, AU$11.6b). Its SQL Server biz, Lync, SharePoint and Exchange all grew, while its commercial cloud revenue skyrocketed by 103%. Update: Microsoft is really looking forward to next quarter. The launch of Xbox One, holiday sales of the Surface 2 and Surface Pro 2 and new Windows 8.1 and Windows Phone devices should give Microsoft a nice Christmas-time cushion. Microsoft has some choice words for Apple's iWork.